Nonprofit organizations often recruit people who have been successful in the business sector to serve on their board of directors. 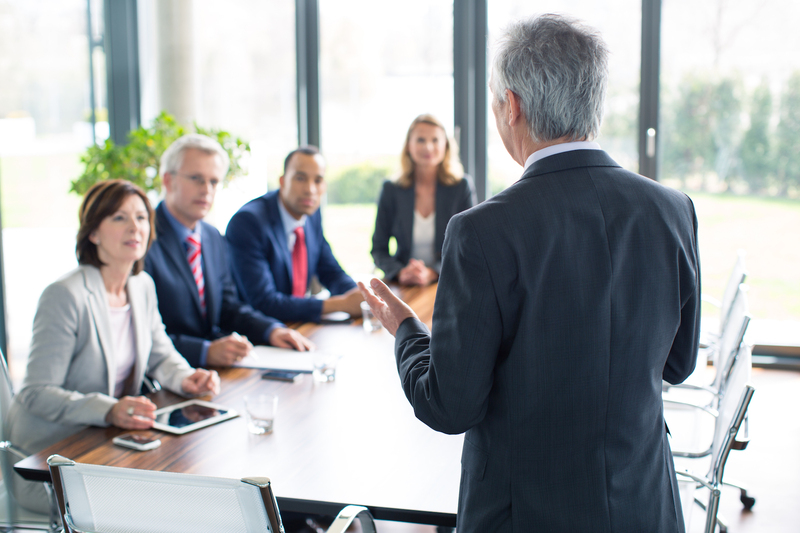 It’s a practice that can work well, enabling a nonprofit to gain valuable perspective from smart professionals—but only if those professionals are equipped to engage actively and meaningfully both in board meetings and in the work of the organization. That’s a big “if,” and it raises lots of questions for board members whose experience lies mainly outside the nonprofit sector. If you know how to probe, nudge, and prod, you can help your board perform better. Doing so starts with courage. In our experience, nonprofit board members are often reluctant to contribute actively to discussions for fear that they will appear uninformed or cause an embarrassing ruckus. To be effective, you must overcome that fear. And then you must ask questions. Ask all your questions, even ones you fear might seem stupid, and keep asking them until you figure out what the smart questions are. The article (“The Four Questions to Ask When Serving on a Nonprofit Board”) appears in the December 2017 issue of McKinsey Quarterly. You can read it here. You can read Manville’s piece here. 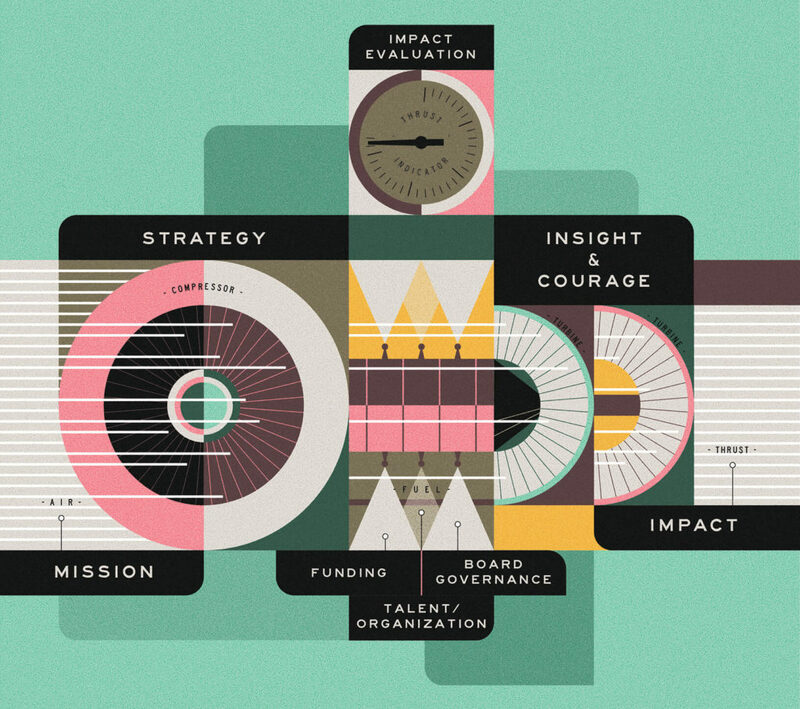 In advance of the publication of Engine of Impact, and in conjunction with release of the Stanford Survey on Leadership and Management in the Nonprofit Sector, GuideStar launched what will ultimately be an eight-part series of posts by Bill Meehan and Kim Jonker. The series, called “Your Engine of Impact,” will cover each of the seven elements that make up their model of strategic leadership, and it will conclude with a post on the role that strategic leadership plays in organizational scaling and in scaling impact. Bill’s involvement in GuideStar runs deep. He was an early supporter of efforts by GuideStar founder Arthur “Buzz” Schmidt to leverage technology in a way that would empower donors to evaluate nonprofits. Bill also served on the GuideStar board from 1996 to 2012, and he holds the title of chair emeritus. 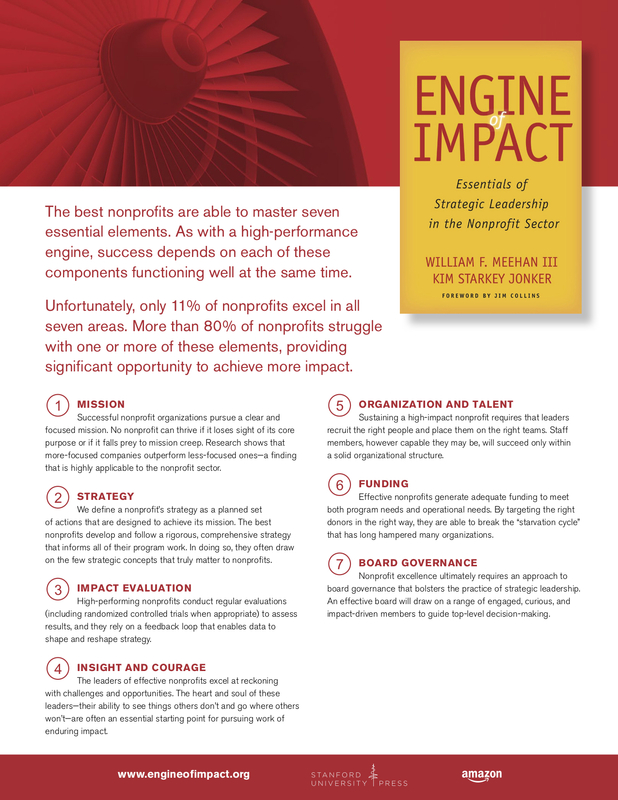 Engine of Impact is, among other things, a culmination of Bill’s longstanding drive to bring greater rigor to nonprofit leadership. A good book review tells you whether a book is worth reading. A great book review illuminates why a book was (or was not) worth writing in the first place. 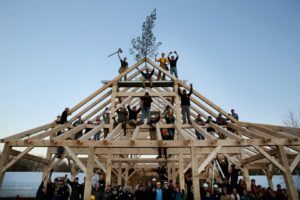 Lucy Bernholz, a senior research scholar at the Stanford Center on Philanthropy and Civil Society and author of the annual Blueprint series on “Philanthropy and the Social Economy,” has posted a piece on Engine of Impact at her Philanthropy 2173 blog that clearly falls into the latter category. The idea that the social sector can both improve itself and, in so doing, improve and challenge, cajole and nudge other types of enterprises to greater action sets this book apart. Meehan and Jonker aren’t providing the nonprofit sector with “lessons learned from commerce” because business knows best, but quite the opposite. There are plenty of lessons for nonprofits from business, but the social sector’s opportunity (obligation?) is to act in such a way that businesses can follow. . . . [T]hey (nonprofits) are the engine of a society that can collectively address its greatest challenges. Viewed in this light, Bernholz observes, the nonprofit sector is an “engine of impact” unto itself. Bill Meehan and Kim Jonker have close connections to Stanford Graduate School of Business and the Stanford Center on Philanthropy and Civil Society, and much of the thinking in Engine of Impact originated on the Stanford University campus. But they also trace the roots of their book project to another institution: McKinsey & Company. Meehan is director emeritus at McKinsey, where he worked from 1978 to 2008. Jonker served as an associate and business analyst at the firm for several years between 1996 and 2003. In an interview posted at the firm’s Alumni Center website, the authors discuss their decision to collaborate on a study of nonprofit leadership, the ways in which their careers at McKinsey informed their perspective on the nonprofit sector, and other aspects of their experiences at the firm. The target audience of Engine of Impact includes executives and staff members at frontline nonprofit organizations whose work has the potential to yield tangible, measurable results. The chief goal of Bill Meehan and Kim Jonker in writing the book, in other words, was to inform and inspire those who are in a position to build, tune, and fuel a true “engine of impact.” Yet the authors acknowledge that nonprofits make up just one part of a system that in various ways fails to support the practice of strategic leadership. [W]hile individual nonprofits have work to do, they alone can’t accomplish the sector-wide transformation that is so necessary. Much of the work of building more effective organizations needs to start, in particular, with the board members who oversee nonprofits and with the donors who sustain them financially. 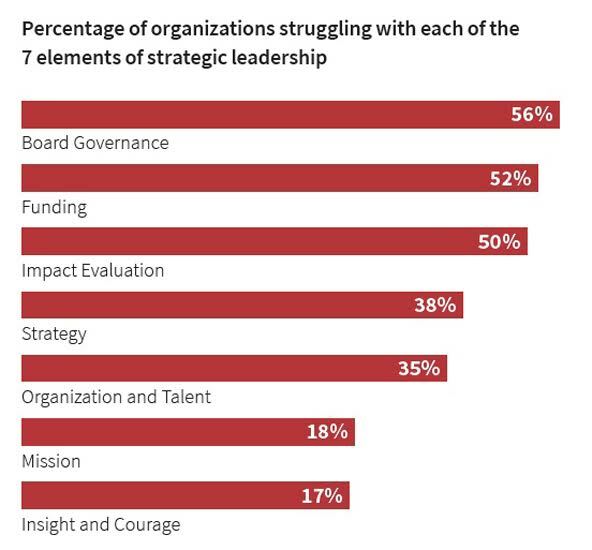 Consider the three areas of performance [board governance, funding, impact evaluation] in which nonprofits are most likely to struggle. In each, influential players within the nonprofit sector can and must help nonprofits develop strategic leadership capabilities. The article, “Filling Essential Gaps in Nonprofit Leadership,” is available here. Foundation leaders and philanthropy observers have issued calls to action that convey a strongly felt need to “resist”—to fight against policies of the new administration that violate ideals that many of us hold dear. That is essential work for organizations that focus on advocacy. But we believe that nonprofits of all types, along with their foundation and individual donors, face a broader task: In a time of social and political disarray, they must demonstrate their ability to sustain a diverse and robust civil society. 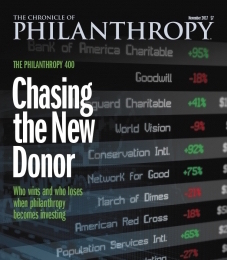 The article, which Chronicle of Philanthropy has made available to non-subscribers for a limited time, is an adaptation of “Strategic Leadership: Now Is the Time,” the concluding chapter of Engine of Impact. The article is available here, at the Stanford GSB website; it’s also available here, as a PDF document. In both formats, the piece contains a brief excerpt from the book that outlines the “engine of impact” model.